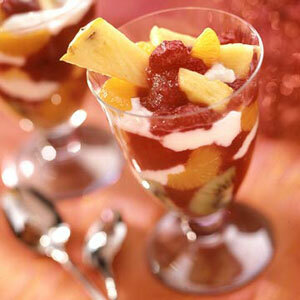 Juicy fresh fruits combine with yogurt for this breakfast treat. Layer the ingredients in a glass bowl when entertaining so people can enjoy the parfait's pretty colors. In saucepan, combine apple juice, sugar, and 1/8 teaspoon cinnamon. Cook and stir until sugar dissolves. Add cranberries. Bring to boiling; reduce the heat. Cook and stir for 3 to 4 minutes or until berries pop. Remove from heat. Stir in applesauce. Cover and chill 30 minutes. In a 1-1/2-quart clear serving bowl, arrange the kiwi around bottom, pressing slices flat to stick to dish. Continue arranging in a pattern up sides of bowl. Spoon the chilled cranberry mixture over the kiwifruit slices in the bottom of the bowl. Top with pineapple chunks and mandarin orange sections. Spread the yogurt over the top of the fruit mixture. Sprinkle the parfait with the remaining 1/8 teaspoon cinnamon. Cover and chill for 2 to 4 hours. To serve, gently fold yogurt into fruit.